Ales Loprais is the pilot and the PR manager of a rally crew InstaForex Loprais Team. He also owns an auto parts manufacturing company specializing in world-famous Tatra trucks. Ales was born on January 1980 in Olomouc, the Czech Republic, into a family of the Dakar Rally champions. He was brought up in the atmosphere of endless preparations for rallies. Since early childhood Ales has been involved into car repairing, spending more time in the garage than at home. In an exclusive interview with InstaForex TV, Ales' uncle Karel Loprais, the six-time champion of the legendary Dakar Rally, said that his nephew was seven when he first sat behind the wheel of his Tatra rally truck. That was the moment when Ales chose his life's path. However, his parents insisted on Ales studying law at a Czech university, but the future rally driver was never to become a lawyer. In addition to rallies, Ales was keen on extreme sports. He explored mountains on his bike, went skydiving and hang gliding. Once his adventures resulted in a vertebral fracture, but, fortunately, without serious consequences. Yet, he had to give up further flying experiments. In 2006 Karel Loprais got a career-threatening injury during the rally which put an end to his racing. Then Ales decided to fill his uncle's shoes, and took part in the Dakar Rally 2007 as a pilot of a truck and got a prize place. In 2008 and 2009 Ales took the bronze in the Central Europe Rally and the Silk Way Rally. 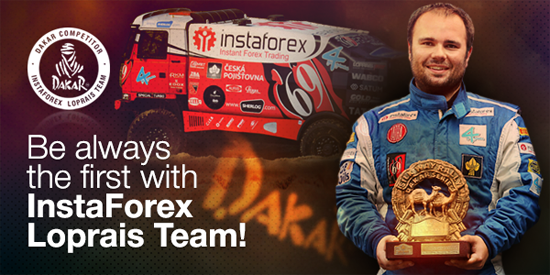 Ales' InstaForex Loprais Team won the long-awaited gold medal in the Silk Way Rally 2011, the second worlds' largest rally, after its renewal and the beginning of cooperation with InstaForex. During the Dakar Rally 2012 Ales came within an inch of winning the overall race, when he got into a terrible accident followed by a long-term recovery from injuries. That summer, Ales and his InstaForex Loprais Team vied with the rally favorite De Rooy for the first place in the Silk Way Rally 2012 one more time, but at the last but one stage they both had technical problems and dropped out from the race. This year Ales is said to be one of the favorites in the Dakar Rally 2013. He was the leader of one stage and finished in the top three in other stages. Behind the wheel of his truck No. 503 Ales showed the best speed and a flawless performance among the rest participants. But during one of the stages the Tatra's engine failed, so the team lost 2 hours and the leadership. Despite its struggles, the team could not make up for lost time. However, according to racing experts and journalists, Ales was the best pilot of the Rally Dakar 2013. Ales tirelessly continues to compete with his rivals and never despairs in the moments of bad luck, because rallies are neither work nor hobby for him; they are the story of his family and his life.